Brakes forced a third successive two-goal draw against York City, storming back from 2-0 down with half an hour to play thanks to a well-taken double from Colby Bishop, writes Paul Edwards. As fog descended on a freezing night at Bootham Crescent, Leamington’s run of five successive wins was a distant memory as City skipper Jordan Burrow scored twice in five minutes early in the second half. Jamie Hood and Kieran Dunbar keep a close eye on proceedings. However, Paul Holleran’s side are developing a very useful never-say-die mentality and extended their unbeaten run thanks to Bishop, whose late leveller saw home fans streaming for the exits. No doubt boosted by their weekend victory over FC United of Manchester, the home side looked to establish an early advantage and Tony Breeden was quickly off his line to deny Jake Wright as he latched on to a header from Burrow to bear down on goal. From the resulting corner, Reece Flanagan was well placed to divert Kennedy Digie’s header over the bar. Burrow drove wide from 25 yards and Kallum Griffiths fired over after a third corner for the Minstermen. Callum Gittings was the first Leamington man to get a sight of goal as Flanagan nodded down for him some 30 yards out but the strike was well over the bar. Colby Bishop fires home Brakes' first. Burrow headed straight at Breeden after latching on to a free-kick, while Wright turned James Mace to make space for himself but the shot was straight at the Brakes skipper. The game became scrappy as the half progressed but while the hosts inevitably had more possession Leamington worked hard to frustrate them. Junior English had a header blocked for a corner which came to nothing, while a quick break forward saw Connor Gudger’s cross intercepted before Bishop had the opportunity to connect. The home support were becoming audibly restless as the half-time whistle blew but they would have something to cheer early in the second 45 minutes. Kieran Dunbar’s 25-yard drive flew wide of the target, while Adriano Moke’s left footed curler was deflected behind by Mace when it looked to be heading for the top corner. It was 11 minutes in when the home side were handed the opportunity to take the lead, Alex Bray bundled over by Jamie Hood in the penalty area for a clear penalty. Burrow stepped up and emphatically sent Breeden the wrong way. Five minutes later it was two. 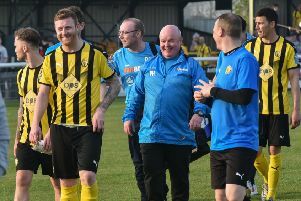 Jack Edwards was penalised by referee Adam Herczeg when appearing to win the ball and his frustration was compounded as Leamington failed to properly clear the free-kick, allowing Burrow to crash home his second of the game. Brakes hauled themselves back into proceedings with 20 minutes remaining as they registered their first shot on target. Breeden’s clearing kick was picked up by Dunbar who sent Bishop clear of the retreating defence with a fine ball down the right which was matched by the finish, the striker cutting into the box and beating Adam Bartlett from a tight angle with a superb drive into the far corner. The game inevitably began to open up in the closing stages as fog began to descend, Gittings blazing a shot across goal and wide after getting into a good position on the left. Bartlett had little to do prior to Bishop’s goal but he just about claimed the ball at the second attempt as Gudger delivered a half-cleared corner back into the box with Bishop lurking. Breeden had to be at his best to deny Burrow a hat-trick as Moke played a cross into the near post and the goalkeeper had a let-off when his clearance fell to substitute Lewis Hawkins on the half-way line. However, with Breeden way out of his goal the chance to kill the game off was wasted. And York paid the ultimate price when Bishop thumped home a header with three minutes to go following a left-wing corner, taking his tally to eight from eight games following his return from an ACL injury. York City: Adam Bartlett, Sean Newton, Joe Tait, Kennedy Digie, Joe Davis, Kallum Griffiths, Jake Wright (Macaulay Langstaff, 46), Adriano Moke, Jordan Burrow, Alex Harris, Alex Bray (Lewis Hawkins, 63). Subs not used: Joe Ironside, Josh Law, David Ferguson. Brakes: Tony Breeden, Junior English, Connor Gudger, Reece Flanagan, Jamie Hood (Jack Lane, 67), James Mace, Kieran Dunbar, Callum Gittings, Colby Bishop, Jack Edwards (Anthony Dwyer, 79), Connor Taylor (Ahmed Obeng, 67).Subs not used: Joe Clarke, James Bowen.